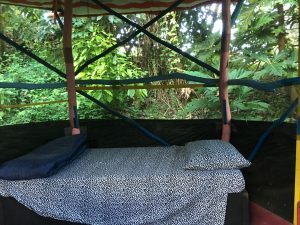 Ulu Hideaway Eco-Hut is one of our most unique creations. We originally built it as a small ‘meditation hut’. However, it ended up evolving into a beautiful lodging tucked away in the furthest corner of the property. This little hut sleeps one single adult. 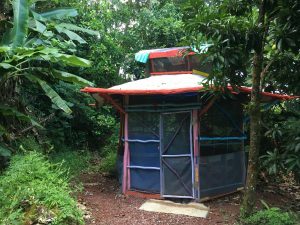 Most of the frame of the hut was built with local Strawberry Guava wood. This is a fast growing tree which is classified as an invasive species. Most of the time, Strawberry Guava is not used for building or any other purpose in Hawaii. Most of the time it is just bulldozed off a person’s land when they are clearing it. So as part of our eco- friendly approach, we removed an prolific native species and used it, as opposed to just cutting them down and wasting the potential of the wood. The hut is dry, open, and secluded. We used insect screens for the walls so guests can enjoy the sounds and sights of the jungle while being protected from the elements. Inside the accommodation there is a single bed, pillow and full bedding. 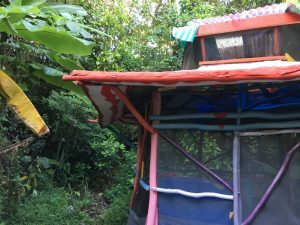 It is one of our most affordable accommodations for a single person aside from the private camping option. Staying in Ulu Hideaway is experiencing Hawaii in a completely different way. Bundled up on a cool Hawaiian night being this close to nature is amazing. Apply or Inquire to stay with us!